Major indicator of market momentum. Also the size of the IPO indicates company overall valuation. Using proprietary methodologies, we determine how mature a company’s SaaS business is. A continual delivery of new features and capabilities to products can indicate a higher probability of customer adoption, retention and success in the market. An important indicator of innovation. A challenging data point to capture on all companies, therefore industry benchmark data is used many cases. An indicator of the most innovative SaaS companies. Votes are acquired by industry experts analyzing and working directly with companies, providing first-hand knowledge of products and processes. A clear indicator of where a company is on the SaaS Maturity curve. 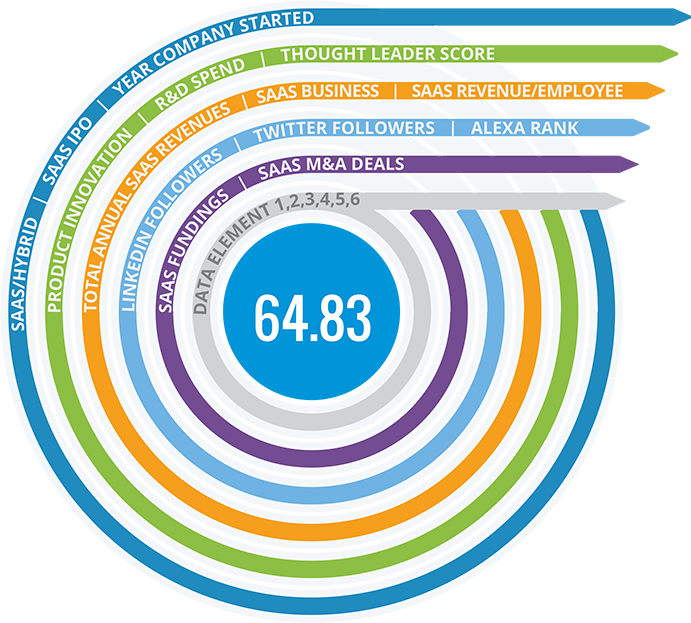 Useful to contrast against a company’s total revenues to see how big the SaaS business is within the parent company. Indicates the focus on SaaS as a business. For transitioning or Hybrid companies, it is valuable to understand how far they are in their SaaS transition journey. Total SaaS revenues ensures consistency when comparing SaaS and Hybrid companies. This is an excellent indicator of overall business effectiveness and efficiency. Indicates market momentum. The size of the round also indicates the maturity and value of the company. Indicates market momentum. The size and type of deal indicates momentum and overall valuation impact. Montclare gathers additional proprietary data points to assess SaaS company performance. Although the description and data for these characteristics are not shared publicly, Montclare leverages and classifies them as equally important to other performance-based measurements in the evaluation of SaaS companies.